Since then, I’ve been chatting to Vineeta Gupta, Head of Children’s Dictionaries at Oxford University Press. I wanted to know more about how dictionaries are put together. How do children’s dictionary publishers establish criteria for lexicons? And how do lexicographers decide which words should be included for each age group? I thought I’d share what she had to say with you, and hope you find this as interesting as I did! “Children’s dictionary publishers tailor their dictionaries for different abilities. We have picture dictionaries and First Word books at the younger level that may contain only hundreds of words, and as a child moves up the age range, the dictionaries become more and more like adult dictionaries and grow in volume and headword coverage. It is important to make the page layout work for children, especially the youngest ones. Children need to be supported as they develop their dictionary skills, and pages give the alphabet down the side, catch-words on top, headwords in colour, and tinted panels with extra language information on spelling and grammar – all for easy navigation. There are a number of factors that determine what goes into a dictionary – curriculum guidance, feedback on current editions, feedback from educational experts, corpus checks, and most importantly, classroom feedback from children and teachers. Classroom testing will usually involve sending questionnaires to thousands of schools, with face-to-face focus groups, and in-depth language analysis completed by a specially appointed language panel. Over the years, the number of headwords in a given dictionary has not changed, but there has been a move to make entries longer. Now it is not enough to give a word and a definition. Children need examples of the word used in context and example sentences. 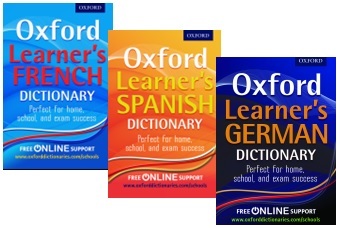 Oxford is unique among children’s dictionary publishers in using citations and example sentences drawn from children’s authors ranging from JK Rowling, Anne Fine, Philip Pullman and CS Lewis. Older dictionaries broaden the range of literature and draw on classics like Dickens, Edgar Allan Poe and JD Salinger, non-fiction writers such as Nelson Mandela and Michael Palin. Oxford’s lexicographers use a very large corpus to validate inclusions according to the frequency of word and its usage. The Oxford Children’s Corpus is unique and contains around 150 million words and is growing. Lexicographers compare a word and its use from the Children’s Corpus with one from the adult Corpus. This can often help distinguish between what a 7-year old and what a 14-year old will use. For example, the word ‘terrible’ in the Children’s Corpus links with ‘secret, storm, fright, danger’, while the adult corpus links ‘terrible’ with ‘tragedy, ordeal, blow, and shame’. This resource helps target word selection, definitions, and context. In the coming weeks, I’ll be finding out more about the Oxford Children’s Corpus. A corpus is a word bank or database compiled from a wide range of sources – books, magazines, newspapers, journals. Oxford use it to monitor language development and provide evidence on how words behave. It is constantly growing and currently stands at about 100 million words! P.S. Don’t forget online booking for Language World closes Friday 13th March!